If you’re building a mobile app, stop right now. The era of mobile apps is over and Facebook — with a touch of Snapchat — won. 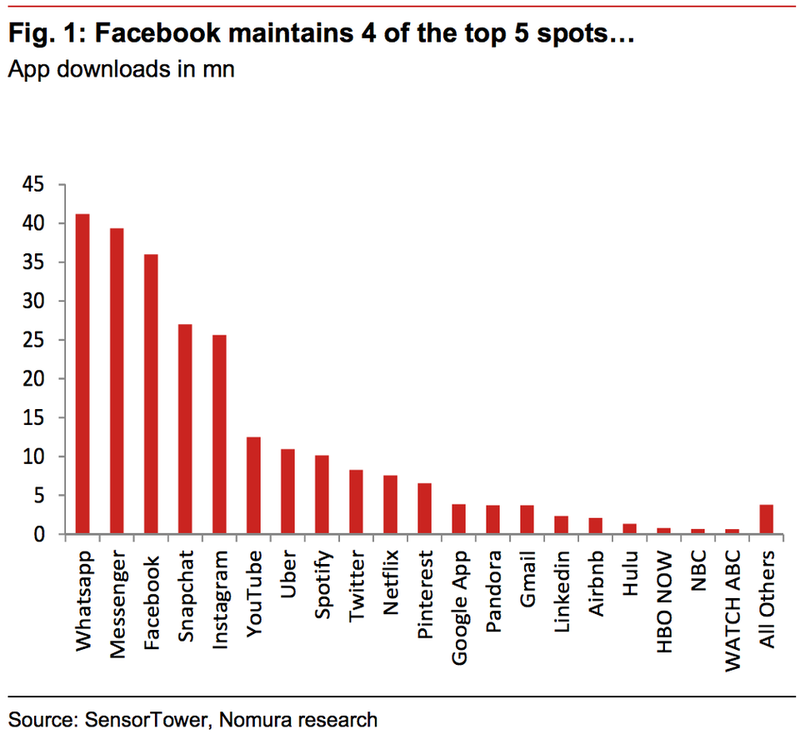 The following chart, which comes to us from Anthony DiClemente at Nomura, shows how Facebook absolutely dominates the mobile app space, owning four of the top five most downloaded apps in May with only Snapchat breaking up its stranglehold on the space. The problem for the broader app ecosystem, however, is that among the top 15 apps in Apple’s App Store, global downloads declined by 3% year-over-year in May. In the US, these same apps saw downloads drop 21% year-on-year. Only Uber and Snapchat saw year-on-year download growth in the US during May. “In our view, this highlights the growing maturation of the internet’s largest mobile platforms’ user bases, particularly in developed markets,” DiClemente said. 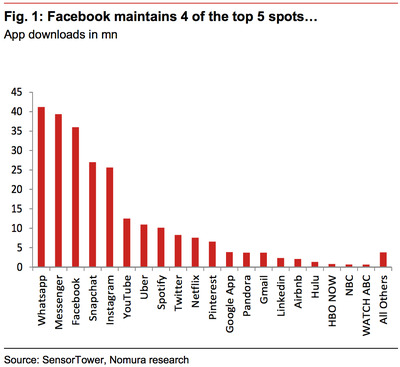 Snapchat, however, is still seeing accelerating download trends. Last month, my colleague Kif Leswing reported that the top 1% of publishers in Apple’s App Store collect 94% of the revenue. In other words, the App Store has effectively become a winner-take-all environment. Matt Rosoff also noted last month that the average number of apps on mobile phones has been stuck at 27 for four years straight. People already have the apps they want, or at least are tapped out at using a certain total number of apps, and so with the pie for mobile apps not getting any bigger, the gains are accruing to the giants of the space. And a market that has stopped scaling is not a market you want to try to break into.